A sweet cinnamon cookie for folks who like their snickerdoodles the way I do -- soft and buttery, with about twice as much vanilla as the recipe calls for. TFA Marshmallow sweetens, softens, and helps take enough of the edge off of the CDS that you shake and vape this, but the vanilla custard really blossoms and everything is so much smoother after just a week's steep. I love snickerdoodle cookies and I think this is a great accurate recipe. So rich and full of great cinnamon flavor. After the 7 day steep the cinnamon blends into the cookie base beautifully and becomes exactly what you want it to be. If you love snickerdoodle try this, if you haven't liked cinnamon vapes because they come off as red hots make this and it will show you the light, if you like vaping awesomeness make it!! Great recipe! Simple to make and delicious. The Cinnamon is a little to high for me to be a real snickerdoodles but I am sensitive to cinnamon. You know how you refer to some mixes as an IQ test? I'm not a huge cinnamon person but I made this anyway. It's good enough that I'm going to cut the CDS in half and try it again :) It was good as published, just too much cinnamon for me. Sometimes it's the simplest recipes that are the best, and this is a damn good snickerdoodle cookie. 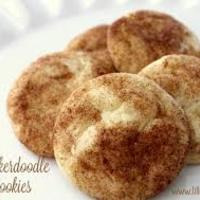 Awesome recipe and spot on to real snickerdoodle cookies. Little rough on the coils but I can live with it. hot damn i like this a lot. the vanilla is up front, which i also like. next batch i might try to sweeten it up a bit, either sweetener or maybe some meringue. Tried this with .5% fa caramel and 1% sweetener it was delicious!! Great recipe thank you for this! Fantastic recipe, this makes my house smell like a bakery. Thanks for sharing.